I am a BIG latte fan which is surprising to some people because I don’t drink coffee. Is that weird? I don’t know, I just never liked coffee and have never had a cup before, I am really into tea though, especially matcha! But sometimes, I like making lattes or elixirs that don’t have any caffeine at all. And a lot of the time I like making elixirs and lattes that fuel my brain and give me energy, because why not?! So today I am sharing my fave superfood mushroom latte, aka brain fuel, featuring one of the best products out there and one of my personal faves- Four Sigmatic. Before I get into this superfood mushroom latte and all the goodness that’s inside of it, I want to chat a bit about these magical mushrooms… no not that kind of magical mushroom. The mushrooms I am going to be talking about are also called functional mushrooms and the brand I use all the time and LOVE is Four Sigmatic. No, this post isn’t sponsored by them, I truly just love their products and believe in them 1000%. Let’s get to what is so magical about these functional mushrooms. Some of those benefits include: improving your immune system, reducing stress, supporting cognitive and physical function and performance and helping with gut health. Those are some pretty AMAZING benefits if you ask me. And these functional mushrooms are also known as adaptogens. The other amazing thing about functional mushrooms are their ability to help with anxiety and stress. I don’t know about you, but I can’t think of a single person that doesn’t deal with some kind or form of stress. Stress is not going anywhere, it’s all about how we respond to it that matters. The reason these are so beneficial in regards to stress is due to the high amount of B vitamins in them. Those B vitamins are essential for our body to be able to respond to stress in a healthy manner and one of the many reasons I suggest to most people supplementing with B vitamins. They are also a good source of vitamin D, in fact they are one of the only plant based sources of vitamin D. Vitamin D (which is actually a hormone, not a vitamin) is essential for brain and nervous system health, which help contribute to a more positive mood. I personally love to take my lion’s mane in the morning to help with my own mental clarity and focus. The other ones I take, cordyceps (pre-workout or also in the morning), chaga whenever cold and flu season is approaching or if I feel that I need the extra boost to my immune system (such as coming back from vacation) and then reishi I take before bed. I am probably the most obsessed with reishi to be honest, but all of them have their purpose. You can see my previous post all about how these mushrooms help with your immune system here and also grab by superfood hot chocolate recipe as well! In my brain boosting recipe, I also use ashwagandha. This is another adaptogen that has shown to be incredibly helpful for our thyroid and providing cortisol support. Cortisol is also known as our stress hormone and when we find ways to support this hormone, we can in fact help our body adapt to stress so it is better able to handle it. The amazing thing about this herb is that because it is an adaptogen, it is able to work for those dealing with either hypo or hyperthyroidism. Beyond just being able to help with the health of our thyroid, they also help with our adrenal glands as well. Our adrenals are responsible for releasing the hormones adrenaline and cortisol in response to stress from the body. If your adrenals are overtaxed, this can lead to adrenal fatigue which in turn disrupts your hormones and lowers your DHEA, causing you to age faster. Ever notice how much those in office age in the span of 4-8 years? Probably because of so much stress. Ashwagandha is great for helping to balance our hormones and is something that I think most people can find benefit from including. So as you can probably already tell, I am a big fan of adaptogens and also using Four Sigmatic products to help with stress and balancing my hormones. 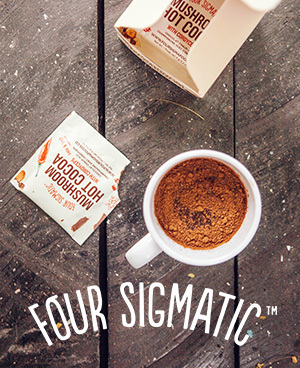 If you are interested in trying out some Four Sigmatic products, I highly suggest checking them out and reading through many of the articles on their site so you can become more familiar with all of their amazing benefits. You can also use my code holisticfoodie to save an additional 10% off your order! YAY! Ok, let’s get to this delicious superfood mushroom latte recipe so that you too can experience the brain and mood boosting benefits for yourself. Heat your milk in a small pot on the stove over medium heat. Once heated through, add to your blender and add all the other ingredients, blend well. Serve and add any additional toppings like cinnamon or bee pollen. Let me know if you try this superfood mushroom latte or if you have played around with any of the other Four Sigmatic products before? Jaclyn, this latte sounds awesome! I had no idea about adaptogens until I read this article. Super informative! I may have to check out these products. Happy Sunday! Yay! So happy it was helpful to you Leanne 🙂 Let me know if you try them! I adore your superfood mushroom latter recipe! Can’t wait to make one for myself! Thanks for sharing!